Apple TV vs. Chromecast: Which Streaming Solution Is Right For You? You want to stream an online service like Netflix or Amazon Instant Video to your TV, but you don’t have a media center PC and don’t fancy fiddling around with an OpenElec installation on a Raspberry Pi How to Install an Operating System on a Raspberry Pi How to Install an Operating System on a Raspberry Pi Here's how to install an OS on your Raspberry Pi and how to clone your perfect setup for quick disaster recovery. Read More . Before we look at which is the better streaming solution, and which is most usable, it’s time to consider the details. You’ll find a slight difference between the Apple TV and the Google Chromecast, not only in specification and build, but price too. Both devices have come down in price noticeably since release; as of May 2015 the Amazon listed price for the Apple TV is $99 (although it’s worth mentioning that other, cheaper Airplay receivers are available 4 AirPlay Receivers That Are Cheaper Than Apple TV 4 AirPlay Receivers That Are Cheaper Than Apple TV The Apple TV is a great device for audio and video casting, but it's expensive. Here are four other awesome AirPlay receivers that are much cheaper. Read More ) while the Google Chromecast is pocket money at $35. With an Apple TV you get 8GB flash storage, 512MB RAM and an Apple A5 CPU, alongside a maximum output resolution of 1080p via a single HDMI port. Connectivity is via a single Ethernet cable (useful if you keep the Apple TV near your router, 2.4 GHz Wi-Fi 802.11 b/g/n and Bluetooth for the device remote and any keyboard you choose to connect. The Apple TV weighs 270g and a compact 23(L) x 99(W) x 99(H) mm, although you will need plenty of space around it for cooling. The PSU is 6 watts and the Apple TV is compatible with phones and tablets running iOS 6 and higher, Windows computers with XP (although you shouldn’t still be running Windows XP Windows XP Security Risks: They're Real And Heading Your Way In 2014 Windows XP Security Risks: They're Real And Heading Your Way In 2014 Given the extensive coverage, you could easily think Windows XP end of support was just a hype. Sadly not. 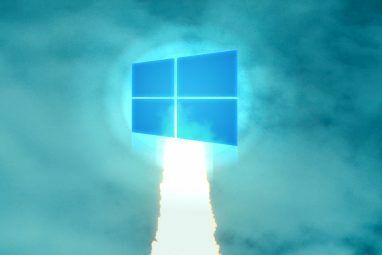 Without security updates, the aging operating system becomes a Trojan horse in your home or business. Read More !) or higher, and Apple computers running Mac OS X 10.3.9 and higher. The compact dimensions of the Google Chromecast (2(L) x 35(W) x 12(H) mm, weighing just 34g) somehow hide a Marvell 88DE3005 (Armada 1500-mini) system on a chip with 512MB RAM and 2GB flash storage. 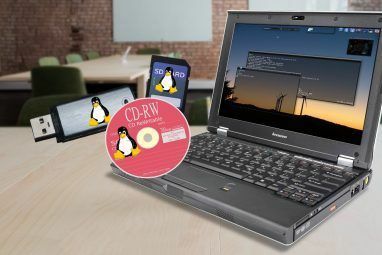 The CEC-compatible HDMI port sends the maximum output resolution of 1080p, and connectivity is via 2.4 GHz Wi-Fi 802.11 b/g/n. A USB adaptor is included, which can connect to a spare powered USB slot on your TV. The Chromecast can be managed with the Chromecast app on Android devices running 2.3 Gingerbread and higher, iPads and iPhones with iOS 6 and higher, desktop computers with Windows or Mac OS 10.7 and higher and Chrome OS. AirPlay and Casting: What’s the Difference? Both devices connect to your TV via HDMI; they each have wireless connectivity, and can be used to stream content from another computer or the web. In fact, there is very little difference between “casting” with a Chromecast and streaming to Apple TV using AirPlay. For instance, both methods require that you press a particular button on your tablet or phone. For Apple TV, you can output directly via supported apps, or drag up from the bottom of your iPad or iPhone and tap AirPlay. On the Chromecast, the job is completed by launching a supporting app Awesome New Chromecast Apps, Tips and Tricks You'll Love Messing With Awesome New Chromecast Apps, Tips and Tricks You'll Love Messing With Apps are adding support for the Chromecast constantly, so keep checking your apps. Until then, read on to learn how to get the most out of your Chromecast with what is available today. Read More tapping the Chromecast button in the menu, then streaming. Apple TV and Google Chromecast are both capable of mirroring the content on your iOS or Android phone or tablet, which can be useful for presentations, or even using the devices as personal computers with the TV as a monitor. Although there is a bit of a lag, mirroring can be very useful for many things, like streaming apps that don’t have AirPlay or Chromecast support. On an Apple TV, mirroring can put a big load on the media streamer so if you’re planning on streaming videos, make sure you’re just using AirPlay (not AirPlay mirroring). On Chromecast, mirroring seems to have very little effect on performance. Better still, if you have a hardware game controller attached to your Android device, gaming on your TV using Android as a games console suddenly becomes feasible. The lag is there, but it’s fairly small and you get used to it. Both methods are capable of streaming video and music from a media server or PC using PLEX to manage the files. All you need to do is install the PLEX app on your iPad or iPhone, setting it up to connect to your media PC, select a video file and then instruct it to play over AirPlay. The method is almost identical for Android, other than tapping the Chromecast button. Most streaming with Apple TV and Chromecast is made possible with apps, known as “channels” on Apple TV. These are pre-installed on Apple’s device, with a different selection depending upon your international location. Using the apps is simple, although being limited to the remote control means that entering a username and password in a service like Netflix is time consuming. Bluetooth keyboards are compatible, however. Being stuck with the Apple TV apps is restrictive, but not so much that you wouldn’t use any. With Chromecast, the device doesn’t have any apps. Instead, it uses Android apps with Chromecast functionality, signified by the presence of the Chromecast button. This makes selecting and playing a movie, TV show, or track very simple. Your experience using a remote on these two devices will differ radically. The Apple TV comes with a compact, iPod-style Bluetooth remote, with which you can browse through the various channels and access the settings menu, and put the Apple TV to sleep. Conversely, the Chromecast comes without a remote. “What madness is this?” I hear you ask. Well, it’s another clever move by Google to keep the price down. Instead of a handheld remote control, the Chromecast requires that you use its mobile app (available for iOS and Android) for configuring the device and then rely on the various apps whose output can be streamed to the Chromecast to act as app-specific remote controls. As good as the Apple TV remote is, the simplicity of the Chromecast solution is inspiring, and liberating. However, the Apple TV can also be controlled using the free Remote app. The impact of the lack of a dedicated remote control on the Chromecast is that the user interface on the TV is essentially a screensaver. To be precise, it is a collection of very interesting and striking photos that look good on any screen size, coupled with some calendar and weather information. Really, it’s what any home media center enthusiast would want from such a solution. Conversely, Apple TV has a full iOS-style user interface, a collection of icons arranged in a grid much like your iPhone or iPad. As useful as this is, and as handy as it is to have a dedicated remote control, the UI can be confusing at times (for instance, it’s easy to end up in the channel settings rather than the Apple TV settings) but most importantly, it can also be slow. 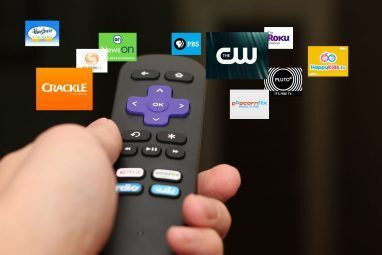 Browsing through the list of channels can be a bit of a slog, and by the time you’re done you could have used a smartphone app to find, locate and begin streaming the same content to a Chromecast and have enjoyed several minutes already. It would be really easy to conclude this comparison with “if you use an iPhone, use Apple TV, otherwise…” but not only would that be trite, it would be inaccurate. As you’ve seen, there is really little between the two devices. For example, we purchased our Apple TV predominantly to stream home movies on Dropbox to our TV, with little interest in watching streaming TV. The presence of Netflix was a bonus, as it is already provided by our cable provider. Now, with the launch of Game of Thrones Season 5, we took out a subscription to Now TV, which is a UK-based service provided by Rupert Murdoch’s satellite TV provider Sky for people who don’t want a long contract. So, we watch Game of Thrones on the Apple TV via the Now TV app. However, Now TV is also available on Android, with casting functionality. What Are You Looking For in a Streaming Solution? As we’ve established, the two devices are very evenly matched. Where one appears superior in one aspect of its design, the other might just win in another. There is very little to choose between the Apple TV and Chromecast. The solution, then, is to pick the device that will meet your requirements. Is there a particular streaming service that you need that might be an exclusive on one platform? Perhaps the price is an issue (although the Apple TV seems to keep coming down in price) or even the need for a dedicated remote control? 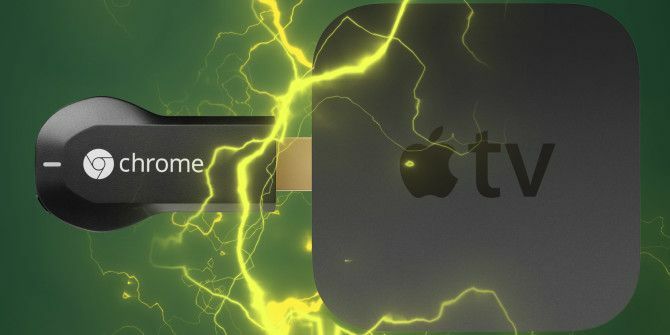 If you’re a fan of iOS, then you might be inclined to pip for the Apple TV; Chrome OS and Android users will probably feel the same about the Chromecast. When we reviewed Chromecast Google Chromecast Review and Giveaway Google Chromecast Review and Giveaway We're giving away a Google Chromecast, so read through our review, then join the competition to win! Read More in 2013, Danny Steiben felt that the device wasn’t as mature as Apple TV, but that isn’t the case in 2015. As the owner of an Apple TV and a Chromecast, with an iPad Air and a HTC One for streaming and remote control, I would say that while the UI and hardware on the Apple TV is superior, the most pleasing streaming solution (largely issue free, unlike the Apple TV which can sometimes need troubleshooting Fix Your Apple TV: Troubleshooting Streaming Issues Fix Your Apple TV: Troubleshooting Streaming Issues You're sitting comfortably, watching something streamed through your Apple TV, when all of a sudden, the picture cuts out, to be replaced with a gray screen. Read More ) is through the Chromecast. But which do you prefer? Tell us why in the comments. Explore more about: Android TV Stick, Apple TV, Chromecast, exclude_ios, Netflix. You all either have never used Apple TV, or you do not know how to use it. The statement re using Airplay is incorrect, becasue if using Apple TV your two choices via another Apple device (iphone, Mac, ipad) are Airplay OR Apple TV; you indicate there is only one choice. As for Apple "hostility" - there are 65 choices / icons offering everything from network TV, to PBS, Crackle, Korean, British, and Netflx, and everything in between. We have not needed anything else since cutting the cord 2 years ago -- because the choice and variety is endless. I don't find either option to be palatable. Apple's problems mostly relate to hostility toward content outside approved sources, but also serious limitations in terms of file format support and playback fidelity for people who have decent A/V setups. The Chromecast needs an internet connection and doesn't support wired connections. The platform is more open, but the hardware still can't handle a 12Mbps stream and 7 audio channels if that's what my source has. Instead, I'd look to Amazon's FireTV, which can be operated with real-deal Plex and Kodi (nee XBMC) support for playback of data in arbitrary format and a good-enough selection of streaming services to make it the best all around option. The Roku 3is not terrible either, but I think they're too slow and make playback of local data too much of a hassle.